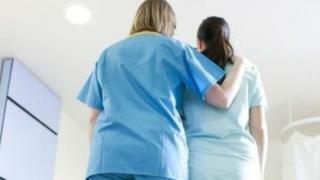 The Scottish government has confirmed the country's NHS is to offer free abortions to women from Northern Ireland. Abortions are illegal in Northern Ireland except for cases where the woman's health is at risk. That has led to women travelling to Great Britain, where they have to pay for terminations. The UK government announced last week that they would be offered free NHS abortions in England in future. The devolved administrations in Scotland and Wales have now confirmed that their health services will also offer free terminations to women from Northern Ireland. Scotland's first minister, Nicola Sturgeon, confirmed last year that she was examining the issue after control of abortion law was devolved to the Scottish Parliament. She told Holyrood that no woman "should ever be stigmatised" for having an abortion, and that it should always be available in a "safe and legal way" for those who chose to have one. The Scottish government said on Tuesday that it will "set out shortly" measures that would allow a woman from Northern Ireland, who is in Scotland, to access an abortion for free on the same basis as women in Scotland. The spokesman added: "The Scottish government's view is that abortion should be part of standard healthcare for all women, and available free from stigma." Anti-abortion group Precious Life has previously claimed that allowing NI women to access NHS terminations would "run roughshod over the law and the democratic process". It said abortion was a criminal offence in Northern Ireland which "exists to protect both mothers and their unborn children", and predicted offering abortions in Scotland would spark a "public outcry". Women seeking an abortion can travel to other parts of the UK to have one privately, but had not been allowed to have them free on the NHS - a position that was backed by the UK Supreme Court last month. More than 50 MPs from the major parties had backed a Labour-led call for the women to have access to NHS abortions in England - leading the UK government to made a concession on the issue rather than risk a possible defeat.